Mystery shopping is a part of market research that measures the quality of service, compliance with standards, or simply gathers specific product and service information. Service can be done on site, via online forms or inquiry calls, or even via chat rooms. Mystery shoppers are considered to be important players with high communication skills. By performing mystery shopping, they are making a tremendous impact in the selected community. All mystery shoppers are briefed with a shopping scenario by which they are either purchasing a product or service, making inquiries, filing the complaints or behaving in any other way that helps capturing their experience. Our mystery shoppers are individuals with different backgrounds, from various European locations, and they all possess high level of communication and critical thinking skills. Prior to any mystery shopping, they are intensively briefed about the scenario, their shop(s) background (if necessary) and their ethical responsibility. In average, we spend up to 5 hours with each shopper for briefing and preparation. ​Scenarios are drafted in cooperation with the client, and they vary in length and details. 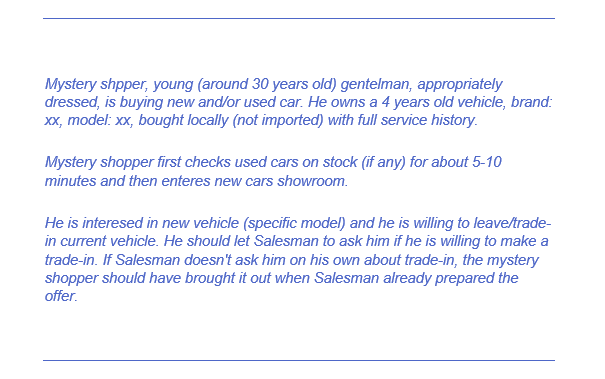 Above is a sample of a scenario draft for automotive industry, where we evaluate the vehicle trade-in interaction and general organization of facilities. In addition to the automotive industry, we can assist you with mystery shopping in other branches, such as retail, banking, insurance, call centres and many more. As we want to provide only high-end services to our clients, all our mystery shoppers go through intense and strict compliance checks. The end product of every concluded mystery shopping is the Mystery Shopping Report. The report captures all the requirements for mystery shopping, other criteria, location details and metrics used. Furthermore, every assessed area is explained in detail and accompanied with charts, KPI tables and maturity levels for a better visual presentation of the captured state. The aim of the detailed report is to show a detailed and overall shopping experience, assessed by fair and high ethical standards. 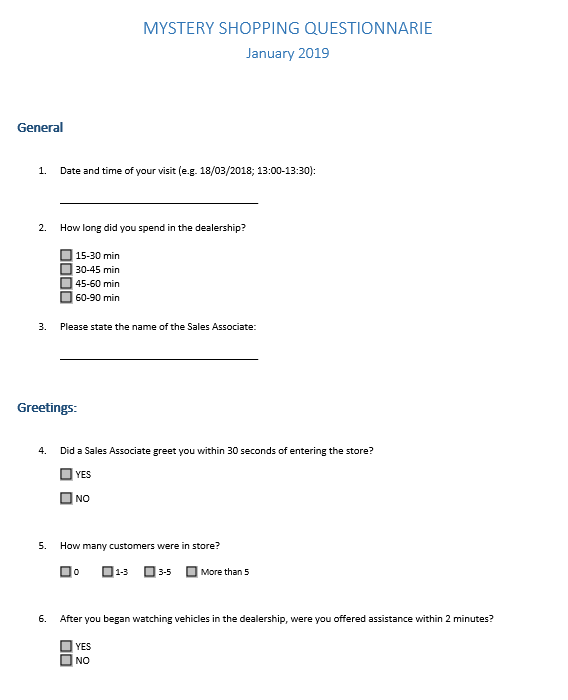 The performance of the report is based on the mystery shopping questionnaire, which is filled carefully by a mystery shopper immediately after the shop visit. Each Mystery shopping report includes KPI metrics tables showing the results of each aspect, and maturity charts that show a clear presentation of areas for improvements. 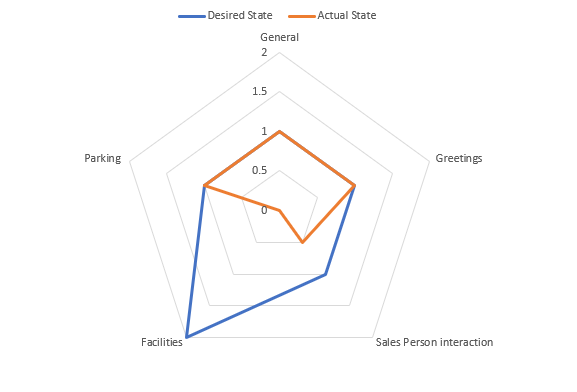 KPIs and desired states are formed in close collaboration with the client in order to capture the realistic goals and to be able to show realistic current state. Detailed and objective proposals for improvement.